Three classic pub snacks plus three bottles of bold pale lager equals a good time for all. 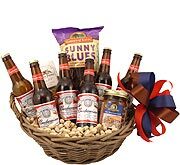 Whether you send yourself a well-deserved treat or ship this basket to someone who deserves it even more, it's time to pop a few tops and enjoy the moment. 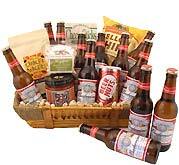 I was really pleased to receive your beer gift. I was struggling to figure out who sent it to me. I live in NC and do drink beer but my Baptist friends "say they don't", so I was left to wonder who would send me beer. My wife and daughter grabbed the munchies but I got the beer. Thanks again. It was a great, unexpected gift. It was a great way to surprise a friend a state away. He loved it!! Only thing is I wish you could pick and choose the snacks. 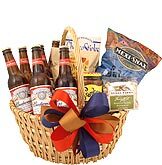 My husband LOVED this basket! Will for sure order again! 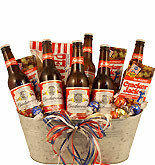 He loves the Bud Basket! Great gift idea! It was wonderful. My husband loved it.